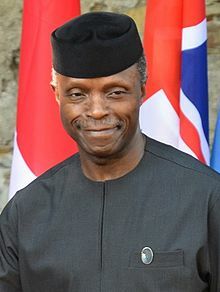 A pan-Igbo sociopolitical pressure group, the South East Revival Group (SERG) has urged Vice President Yemi Osinbajo and Governor Abiola Ajimobi of Oyo State to exercise restraint in their utterances as the country goes into general elections next to avoid pitching their Yoruba ethnic group against the Igbos. The national coordinator of SERG, Chief Willy Ezugwu in a statement issued in Abuja on Monday recalled that "while speaking at the Alaafin's palace, the Vice President had urged the Yoruba to vote for President Muhammadu Buhari to pave way for Yoruba presidency in 2023, but Governor Ajimobi took the narrative higher by declaring that the 2019 election was between the Hausa and Yoruba alliance on one hand and the Hausa and Igbo on the other. "We condemn in strongest terms possible this brand of ethnic politics and this unprovoked and unjustified attacks on Igbos by the two Yoruba leaders. Such utterances can spake ethnic cleansing or inter tribal crisis. "Nigerian leaders must live by example and avoid hate speech ahead of 2019 general elections. This is important because we must have a country first before we can think of who rules over its affairs. "Nigeria is bigger than our regional ethnic sentiments. We should rather focus on issues of justice and peaceful coexistence to save the country from disintegration. "At any cost, Nigerian leaders who truly love this country must avoid fanning the embers of ethnicity just to win elections. Such seed may give you victory but it will ultimately sow distrust among ethnic groups in the country. "At no time in this country were we more divided along ethnic lines than today. It is dangerous for the survival of Nigeria and inimical to national security and development", the SERG stated.